This is a guest post from my husband, Michael, who travels the world and brings home stories of his many culinary adventures. 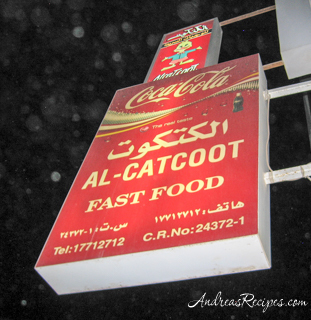 This one brought back memories of one of my favorite middle eastern foods. The journey from Dulles Airport in Northern Virginia to the Bahrain Airport in the middle east takes about thirteen hours. Passing through customs I’m jet lagged but eager to sample a bit of the culture. So when my friend met me in the terminal with evening’s options I latched on to the first thing he mentioned, which was a Shawarma Crawl. Seems there are a group of guys he works with that have partaken in this event several times and were willing to indoctrinate us into the local custom. The rally point was an Indian restaurant called Silk where we each selected a 24 ounce Kingfisher beer. After introductions around the table we all were drawn to the cricket test match on the television and pooled our knowledge in an attempt to figure out the game. We quickly agreed the sport was a bit too heady considering the evening’s planned festivities. Looking back it was strange that we started off the evening with an Indian beer in Bahrain, but like many cities in the region Manama contains a broad mix of cultures and influences. Since my friend and I were the “newbies” we were labeled the control group. 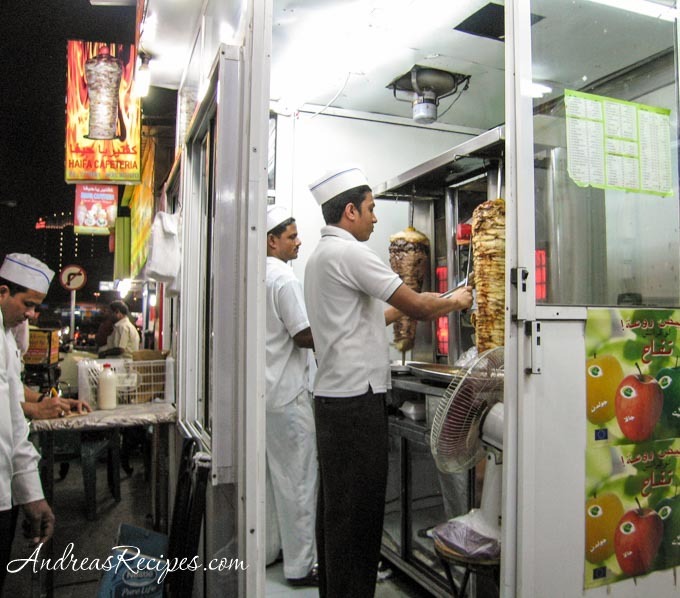 At each location we all agreed to order the same shawarma so there would be a fair comparison, and chicken was the target. Although we could discuss each vendor’s offering, there would be no grading until the end. The veterans joked about previous participants and the outcomes of their experiences which included tales of their bodies late night repulsion of these cultural gems and a lot of regretful cursing. Not surprising these former members of the crawl were not present for tonight’s adventure. Fully hydrated we headed for shawarma alley, a short walk down the city road. Cars and motorcycles cruised by revving their engines as they cruised by again and again. As if we called ahead, the uniformed vendors motioned us in as we walked by their shops, the four foot high spits of meat and chicken rotating past red hot electric coils. We promised them all we would be back and headed for the shop at the far end. We ducked inside and pulled up worn plastic chairs to the Formica topped table and placed our orders. 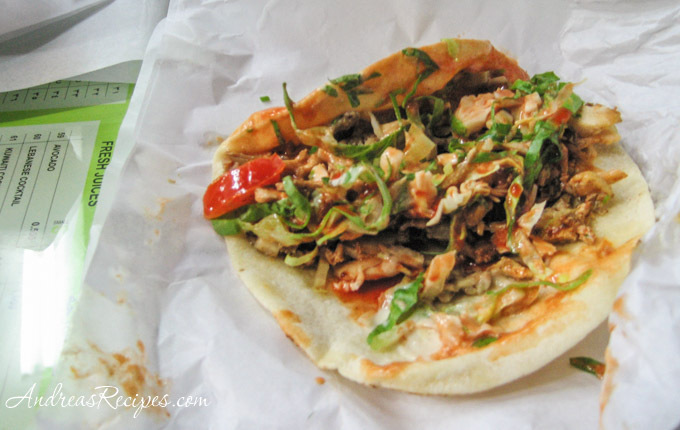 Shawarmas are standard middle eastern street food, costing anywhere from .4 to one Bahrain dinars or about one to three US dollars. They are served rolled up in paper resembling a party favor. I unwrapped the first entry and noticed the grill marks on the flat bread , the thinly shaved rotisserie chicken complimented with slivers of tomatoes and shredded lettuce. We each doused our sandwiches liberally with bottles of watery hot sauce from the tables and dug in. The exterior was soft and elastic and as I chewed, I could taste the layers of flavors starting with the chicken, then vegetables then the bread finished off by the hot sauce. It was really amazing how something so simple was so good. We asked the owner if we could take pictures where he nodded and grinned with approval. Onto shop number two. As we placed our orders and at an outside table, one of our team queried the group on how a shawarma might do at football games. We all agreed there was an entrepreneurial opportunity here yet to be tapped. This shop also had fruit drinks the veteran crawlers spoke highly of, so we each agreed for the good of science to partake in one of these for the good of the data. I ordered the lemon mint which was a nice blend of two flavors I wouldn’t consider putting together. 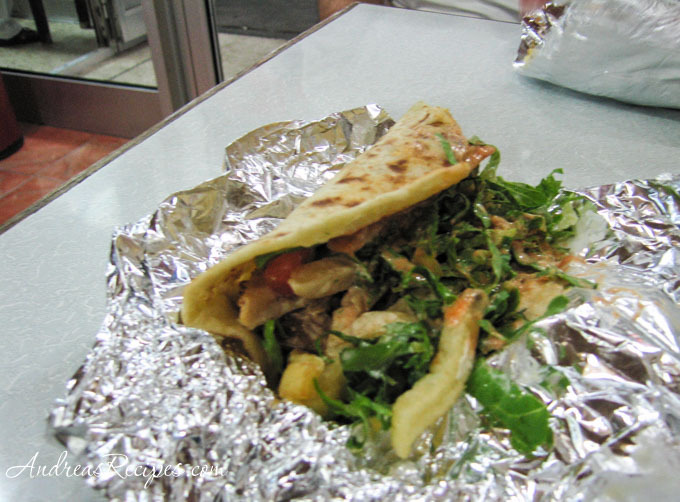 Now onto the next round of shawarmas, these were a bit smaller and the bread thinner, but the taste was still fairly good particularly when doused with hot sauce. 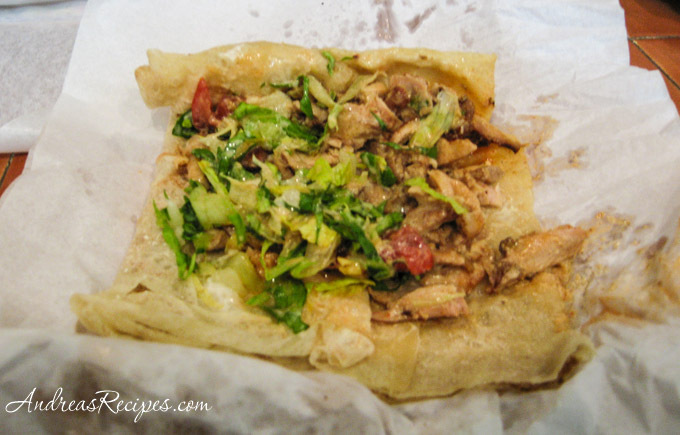 Of special note when it comes to the shawarma crawl is to monitor your liquid consumption because the vendors and their tiny shops do not contain modern facilities, so if you ask where the nearest restroom is they chuckle politely and motion down the nearest dark alley. Onto shop number three. We took our seats again in a small room banded by mirrors and ordered the next round. The shawarmas came in quickly two at a time. The bread on this version was thinner almost crepe like and instead of round it was more rectangular and doubled over. The lightness of the texture made it more crunchy and frail, but still tasty. At this point the volume of shawarmas was starting to kick in and I’m feeling like I’m sitting by Adam in a Man versus Food challenge. We newbies look to the other end of the table at the veterans as if waving a white flag of surrender. We all agree we’d had enough. Now for the voting. My friend and I being the control group got to go first and both rank the shawarmas 1, 2, 3 in the order we ate them. The lead veteran looked back at us with great surprise and announced out of the long history of the shawarma crawl, or at least as far back as anyone could remember, the consensus was always 3, 2, 1 on the ratings. Having initially felt like we had broken some sort of code, the veterans conceded the last shop was a poor showing that night when compared to the past, and we later all agreed the edge was slim between numbers 1 and 2 this particular night. We pooled our money for the last round and headed for the exit making a right past the two last shawarma vendors. They seemed a bit disappointed we left them out of the running, but promises were made that at the next crawl, future participants would start with them. 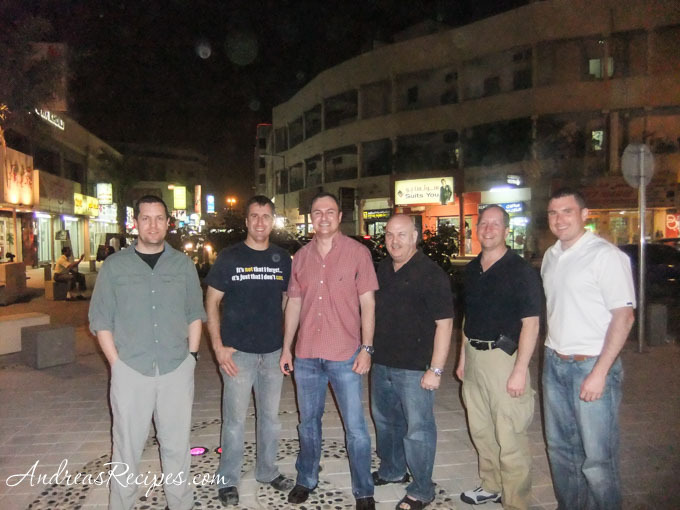 I was amazed how such a simple event brought together such a diverse group of men. Between bites of the competition, we would joke, talk about sports and what was going on in the world many times resulting in gut wrenching laughs, all in a place where a month earlier the media were showing protesters in the streets and reporting full scale civil unrest. When I returned to the motel I noticed similar internet reports for that day and into the evening. I just goes to show the news agencies sometimes go to great lengths to find the nuggets of unrest and report them back to us in the U.S. again and again thinking that is what we want see. At least that evening, in this part of town, the people were friendly and welcoming, the streets were absent of protesters, and somehow it seemed like the safest place on earth. I usede to live on ‘swarma alley’ 93-95 when I was w/ the US Navy in Juffair. I used to always stop by a swarma shop on the way home. It is an aquired taste at 1st but I do miss them.